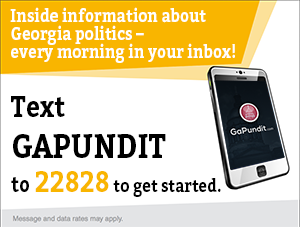 Today’s historical moments below combine to show some of the major influences on Georgia politics and governance since her founding, and how the same conflicts have played out across the world, from Northern Ireland to India, to stages of rock and roll shows. 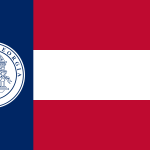 On January 30, 1788, the Georgia legislature passed a resolution calling for a state Constitutional Convention in Augusta to adopt a state Constitution that conformed to the new Constitution of the United States. On January 30, 1862, the United States launced its first ironclad warship, USS Monitor. Franklin Delano Roosevelt was born on January 30, 1882 in Hyde Park, New York. In 1942, Roosevelt ordered Japanese-Americans on the west coast of the United States into concentration camps, leaving German and Italian Americans free. On January 30, 1935, the Rev. Martin Luther King, Sr. protested segregated elevators at the Fulton County Courthouse. On January 30, 1948, Mohandas K. Gandhi was assassinated. 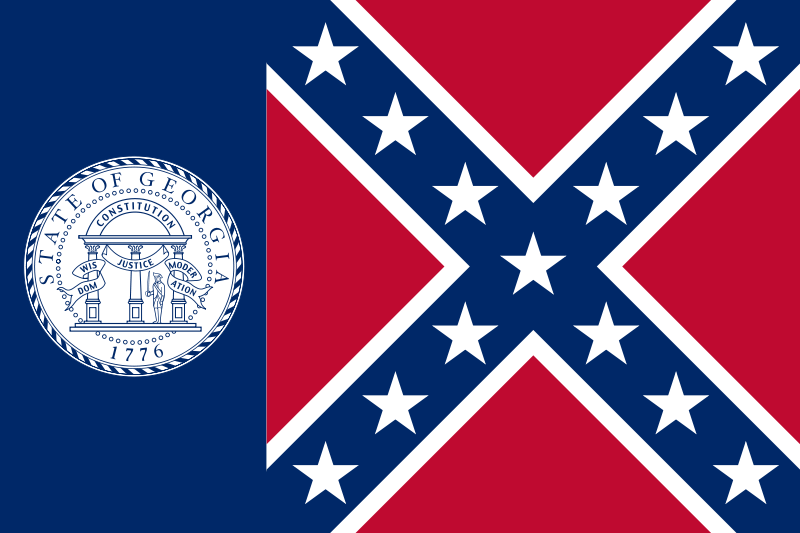 On January 30, 1956, six members of the Georgia State House of Representatives introduced House Bill 98 to replace the red and white stripes on Georgia’s flag (above) with a Confederate battle flag (below). That same day, a bomb was thrown at the Birmingham, AL home of Rev. Martin Luther King, Jr.
January 30, 1972 is remembered as Bloody Sunday in commemoration of the shooting of 26 civilians by British troops in Northern Ireland. 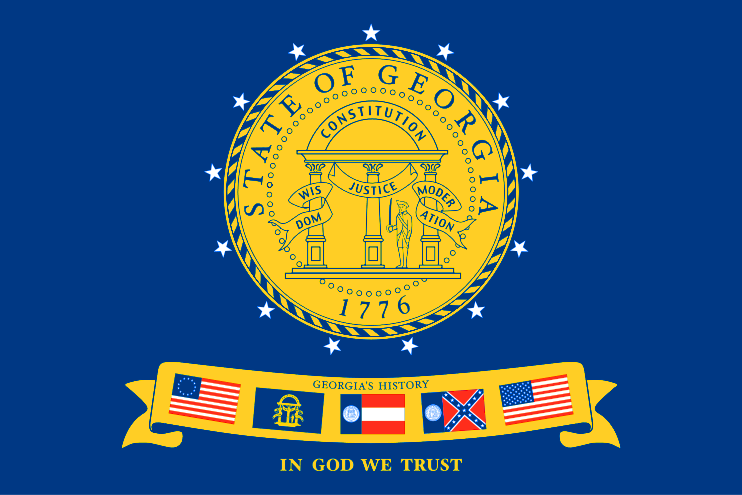 On January 30, 2001, the Georgia State Senate passed a house bill changing the state flag from the 1956 version to one that aggregated the State Seal and five former state flags, pictured below. Abrams narrowly lost the state’s race for governor in November after a lengthy dispute over blocked votes. She will address the nation in a prime-time speech shortly after Trump finishes his address to a joint session of Congress next Tuesday night. “Stacey Abrams offers a welcome, stark contrast to President Trump’s politics of division and lack of leadership as American families are still feeling the impacts of his self-imposed shutdown,” Schumer said. “I plan to deliver a vision for prosperity and equality, where everyone in our nation has a voice and where each of those voices is heard,” she said in a statement. Governor Brian Kemp said a tax on Netflix and chill is unlikely to pass, according to the AJC. Gov. Brian Kemp said he would likely oppose a proposal that would impose a tax on internet services like Netflix, e-books and music downloads to raise money to expand rural broadband access. “My first inclination is not to look at tax increases to pay for this,” he said in the interview, which aired Tuesday night. Some State Senators are moving forward with a resolution to ratify the Equal Rights Amendment, according to the AJC. On Monday, state Sen. Nan Orrock, D-Atlanta, introduced Senate Resolution 55, a measure to ratify the Equal Rights Amendment that was approved by Congress in 1972. Thirty-seven states have passed it. A 38th is needed. And whether it matters could depend on whether a self-imposed deadline that accompanied the proposed amendment is written in stone. But for the moment, that’s not important. The news is that, though it’s a Democratic measure, SR 55 already carries the signatures of every single member of the Senate Republican women’s caucus. I.e., Sens. Kay Kirkpatrick of Marietta and Renee Unterman of Buford. State Senator Harold Jones (D-Augusta) introduced legislation to remove drug possession from the list of convictions that prevent someone from voting, according to the Augusta Chronicle. Jones said attitudes have changed about possession of drugs, especially in light of the opioid crisis. “The general consensus in the conversation surrounding opioid abuse is that narcotic use is more of a health concern than a criminal justice issue,” he said. The bill exempts possession of all illegal drugs, not just opioids, from the felony convictions that disqualify a voter’s registration until he or she completes a sentence. Jones, a former state court prosecutor in Augusta, has introduced drug-related legislation in the past and reintroduced a bill this year limiting the penalty for possession of up to a half-ounce of marijuana to a civil fine of up to $300. Possession of a half-ounce to two ounces is limited to a misdemeanor with a sentence of up to a year and a $1,000 fine. State Rep. Emory Dunahoo (R-Gainesville) introduced a resolution asking Congress to consider term-limiting themselves, according to the Gainesville Times. According to Article V of the U.S. Constitution, a convention can be held to propose an amendment to the Constitution if two-thirds of the state’s legislatures sign on. So far, 12 states have passed resolutions calling for a convention to evaluate term limits. Dunahoo named the recent federal government shutdown as an example of the negative effects of some lawmakers’ unwillingness to compromise. “It’s for discussion, for every state that passes this resolution to come to the table to make sure that Congress and our Senate understands that they are there to represent the people,” Dunahoo said. State Rep. Scot Turner (R-Cherokee) wants legislation to prevent rideshare services from prohibiting drivers with carry permits from carrying weapons while driving for the services, according to the AJC. “A person who is engaging in a ride-share (service) does not forfeit their Second Amendment right to protect themselves,” Turner said. The Holly Springs Republican said he’s seen a number of reported carjackings in Atlanta and across the country. In September, for example, two people are accused of pulling an Uber driver from his car while at a red light in Buckhead and pistol-whipping him before stealing his car. If passed, House Bill 74 would keep ride-share companies from prohibiting a driver who has a state-issued license to carry firearms in his or her vehicles while driving for the service. Turner said potential criminals know the drivers can’t have weapons and seek them out. Georgia’s Department of Behavioral Health and Developmental Disabilities is asking for more money in the next state budget, according to the Rome News Tribune. The agency that oversees Georgia’s state hospitals is asking for an additional $7 million over the next five months to cover the cost of basic maintenance and operations. “This is the first year DBHDD has felt the gap between what it takes to keep a hospital running and Medicaid funding,” said Commissioner Judy Fitzgerald of the Department of Behavioral Health and Developmental Disabilities. Fitzgerald presented her case Monday to the House Appropriations Committee’s subcommittee on human resources chaired by Rep. Katie Dempsey, R-Rome. It was the first day of what Dempsey said would be two sessions on proposed amendments to the fiscal year 2019 budget that runs through June 30. The department still operates five state hospitals with shrinking populations. It’s also responsible for two facilities that already have been closed: Northwest Georgia Regional Hospital in Rome and Southwestern State Hospital in Thomasville. Voters in Lawrenceville and Snellville will vote March 19, 2019 on whether to extend Sunday alcohol sale hours, according to the Gwinnett Daily Post. Both cities will hold referendums on March 19 to decide whether alcohol sales should be allowed at restaurants in their respective municipal limits during brunch time, from 11 a.m. to 12:30 p.m. Sundays. State legislators passed legislation last year to let voters in local communities decide whether restaurant alcohol sales should be allowed earlier on Sundays. Officials are warning voters that while the brunch referendums will be held on the same day as Gwinnett County’s MARTA referendum, voters will not be able to cast ballots on each issue at the same location. Ballots cast for the MARTA referendum will have to be cast at the same polling locations that voters go to for federal, state and county elections. Atlanta Board of Education Member Byron Amos will leave the Board to run for Atlanta City Council in a March 19, 2019 special election, according to the AJC. Northeast Georgia Medical Center Gainesville has been nationally-certified as a Level II Trauma hospital, according to the Gainesville Times. Jesse Gibson, the hospital’s trauma program manager, said the facility was first designated as a Level II trauma center by the Georgia Department of Public Health’s Emergency Medical Services & Trauma Office in 2013. While the state-level verification was a meaningful first step in the trauma center’s journey, Gibson said the recent national verification confirms the facility’s ability to provide the necessary resources to address the trauma needs of injured patients. Northside Hospital and Gwinnett Medical Center may be ready soon to consummate a merger, according to the Gwinnett Daily Post. Health care industry officials say the deal is close to approval by the Federal Trade Commission. That approval may come within a month or even sooner, say the officials, who are not associated with Northside or Gwinnett and who spoke to GHN on condition of anonymity. Both Northside and Gwinnett spokespeople said Tuesday that they were not aware of any FTC decision. The federal agency was affected by the recent partial shutdown of government operations. The Port of Savannah set new records for yearly throughput, according to the Savannah Morning News. The port moved 4.35 million 20-foot equivalent units, or TEUs, in 2018, a 7.5 percent increase over the same period in 2017. The month of December was also the busiest in port history with an increase of 8.7 percent in TEUs handled. Augusta has issued an RFP for a new private probation company, according to the Augusta Chronicle. Ads began running Tuesday to seek requests for proposals to run probation services for the court. This comes less than three years after an in-house county probation department was created in the wake of a national movement against private probation, a movement that began in large part in Augusta. In the midst of budget talks late last year, city Administrator Janice Allen Jackson recommended exploring the option of privatizing probation services. In support of that recommendation, she prepared a graphic showing that the cost of operating the in-house probation department was higher than the department’s revenues since it began in late 2016. The graphic didn’t address the $12.27 million collected from fines paid by those convicted of misdemeanor offenses and city code violations during that time period. In October, Jackson told the Augusta Commission the program needed a $952,080 subsidy to cover a gap in probation and monitoring fees nowhere close to covering the program’s $1.5 million budget. Columbus is considering options for the increasingly problematic Government Center, according to the Ledger-Enquirer. A complete demolition of the wings and garage. A new judicial center on the existing site and complete renovation of the tower for administration and a new parking garage. The second option is a complete demolition of the tower, wings and garage on the existing site with a new judicial center, new administration building and new parking garage. It would be starting over from scratch on the existing site. The third option includes complete demolition of two wings and the garage. A new judicial center with fewer floors, new garage and administration building will be constructed on a site to be determined. This study does not include reviewing options for a new site but it would be a site in another location, Hodge said. It would include graded parking on the site with no parking garage. The fourth option would move the new building to a new site. It would include a new judicial center and administration building as determined by capacity. Macon-Bibb County will face daunting prospects as they move into budget season, according to the Macon Telegraph. Among the key topics for this budget season will be a new employee retirement contribution plan and potentially using general fund money to pay purchase some county vehicles, said Julie Moore, assistant to the county manager, during Tuesday’s commission retreat at Middle Georgia State University. Once requests are made, Mayor Robert Reichert will then present his budget in May and commissioners will have six weeks to comb over the details before voting in late June. Last year, the commission narrowly approved another property tax increase as part of its $164 million budget. The 3-mill tax increase was the second such increase in as many years. That vote came weeks after commissioners initially approved a last-second $149 million budget that did not include funding for recreation, buses, libraries and more. Another tax increase this year could lead to a revolt by residents, Commissioner Larry Schlesinger said. Macon Transit has fewer buses on the road since last year’s budget shortfalls, according to the Macon Telegraph. Over the past two years, the Macon-Bibb County Transit Authority has dealt with a $1.2 million budget reduction and in response transit officials are putting a half dozen fewer buses on the road. The changes should save the transit system between $300,000-$400,000 this year, but so far there’s evidence it’s impacting some riders, said Craig Ross, president and CEO of the transit authority. Several years ago there were 1 million trips taken on Macon buses and this year the system is on track to have 500,000-600,000 trips taken, Ross said. Former Whitfield County Commissioner Leo Whaley, a founder of the local Republican Party, has died, according to the Dalton Daily Citizen. Whaley was one of the founders of the Whitfield County Republican Party in the early 1960s. “We weren’t large enough to be recognized as a party then. We had what they called an association,” Whaley said in a 2016 Daily Citizen-News interview. Whaley — who attended three Republican National Conventions, served on the Cohutta Town Council for 25 years and served one term on the Whitfield County Board of Commissioners — passed away on Friday. He was 83. Wiregrass Georgia Technical College will receive a $30 million dollar bump under Governor Brian Kemp’s proposed budget, according to the Valdosta Daily Times. Nearly $30 million in state funding has been proposed for the construction of a new building at Wiregrass Georgia Technical College. The funding is included in the proposed bond package of the budget Gov. Brian Kemp has pitched for next year. State lawmakers must still sign off on the spending plan. The 96,000-square-foot building would house updated classroom and lab spaces for the college’s allied health programs, such as its associate nursing degree, dental assisting, pharmacy technology and several other specialties. The project will help the college keep pace with the demand for these health-care workers in South Georgia, said Rep. John LaHood, a Republican from Valdosta who also owns a senior-care business. The Camden County Spaceport has filed its application with the Federal Aviation Administration for a permit to conduct launches, according to The Brunswick News. The submission took more than three years to comply with the regulatory requirement to conduct orbital and suborbital launches from the site in Camden County. Gov. 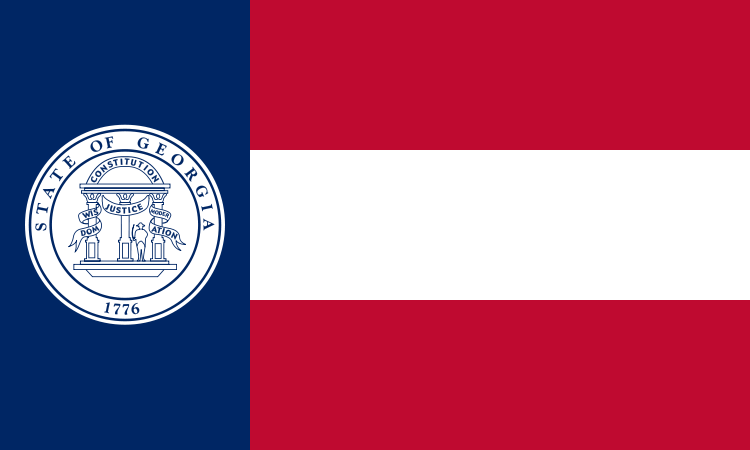 Brian Kemp was among the many influential public officials to express support for the application as an important development project and STEM opportunity for rural Georgians. Kemp described Spaceport Camden as a “visionary project that will bring high-paying aerospace jobs to Southeast Georgia” and create a new wave of STEM education and career opportunities in the region. “Spaceport Camden will also support our first-class universities and technical colleges ensuring that students who are educated in Georgia stay in Georgia to pursue their careers and raise their families,” he said. The Glynn County Public School System is working to develop an app for anonymous reporting of problems, according to the Brunswick News. The school system will launch a new program on Feb. 8 called “STOPit,” an app that empowers students to help themselves and others by anonymously reporting problematic behaviors like bullying, cyberbullying, threats, hazing, self-harm and more. Coweta County is conducting a point-in-time census of homeless people, according to the Newnan Times-Herald. The state-wide point-in-time count is based on where someone slept the night of Jan. 28. As long as volunteers ask people about that night, they can continue to survey people through the end of the week. Data from the count will be used to apply for grants to help homeless people. Local service organizations are also surveying people they come in contact with, and are submitting information about any people that they are providing motel stays for. The City of Demorest is asking for citizen help in locating a half-million gallon per day water leak, according to AccessWDUN. The Harbin Clinic Gallery in Rome will feature art by, and inspired by, the late Georgia folk artist Howard Finster, according to the Rome News Tribune. A smidgen of the 46,000 pieces of folk art created by a well-known Summerville artist will be on display at the Harbin Clinic Gallery at Makervillage beginning Friday at 7 p.m.
Howard Finster, a preacher and bicycle repairman, became an artist at the age of 65, said Cameron Cook, operations director for Paradise Garden Foundation. The coke bottles displayed at the exhibit were all made by Finster Festival exhibiting artists, she added, which is held every year at Paradise Gardens in Summerville. Also on display are paintings done by Finster, which contains little sayings he invented, folk art suspended from the ceiling, small wooden signs and photographs of the artist himself. The Harbin Clinic Gallery will open to the public for free Friday night at 7 p.m. and feature food, art and live music by the Barbaric Yawps.